Download "THEME: God is awesome and should be praised." 2 Dear Parents Welcome to Bible Time for Kids. 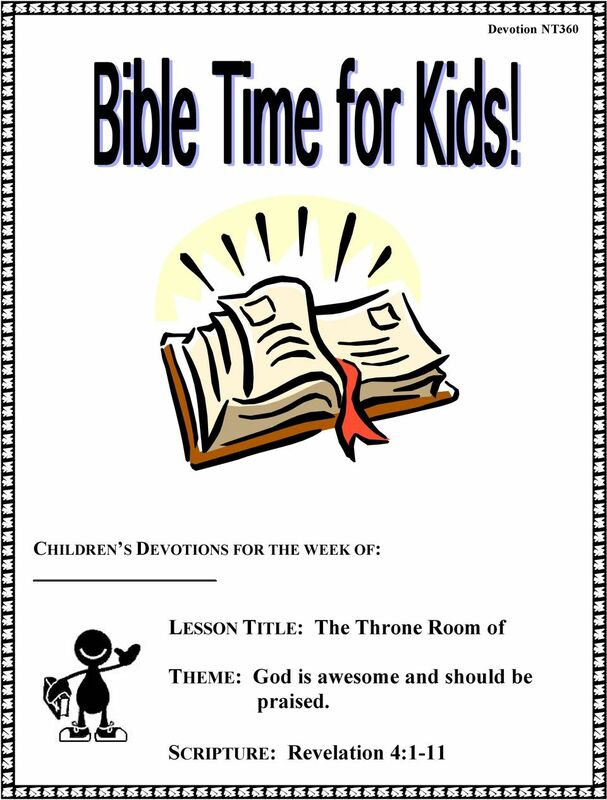 Bible Time for Kids is a series of daily devotions for children and their families. Our purpose is to supplement our Sunday morning curriculum and give you an opportunity to encourage your children to develop a daily devotional life. We hope you and your family will e blessed as you study God s Word together. 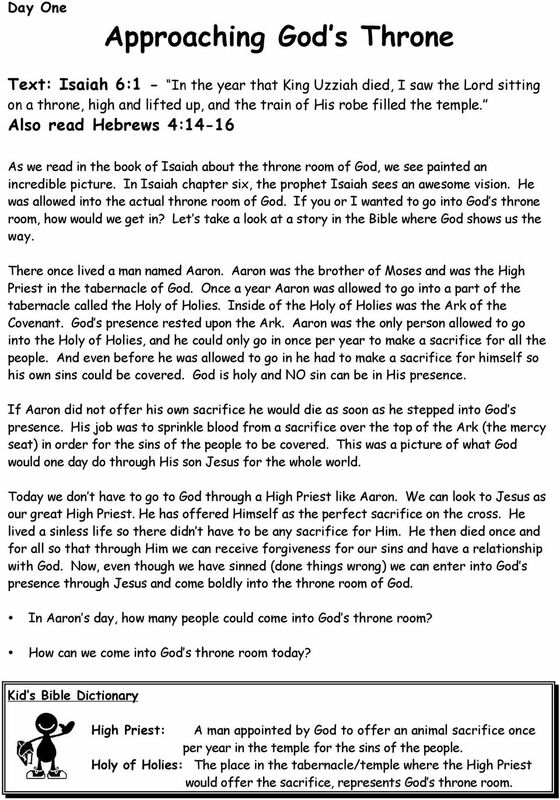 This week in Children s Church we learned about The Throne Room of Heaven. In Revelation chapter 4 we see a wonderful picture of heaven. In this picture we see that everyone in heaven is praising the Lord. There is beautiful praise and worship because of the presence of the One who is worthy of all praise. It s hard to imagine that day, but one day we too will be in heaven praising and worshipping the Lord. The theme of our lesson was God s awesomeness and how that produces within each of us a desire to worship Him. There are so many ways that we can worship and praise the Lord. Our prayer is that this week you can discover together as a family wonderful ways to worship the Lord together. The section of scripture that we studied was Revelation 4:1-11. The following five devotions are based on either the scripture and/or the theme for Sunday s lesson. As a starting point it would be good for you to review these verses with your children. 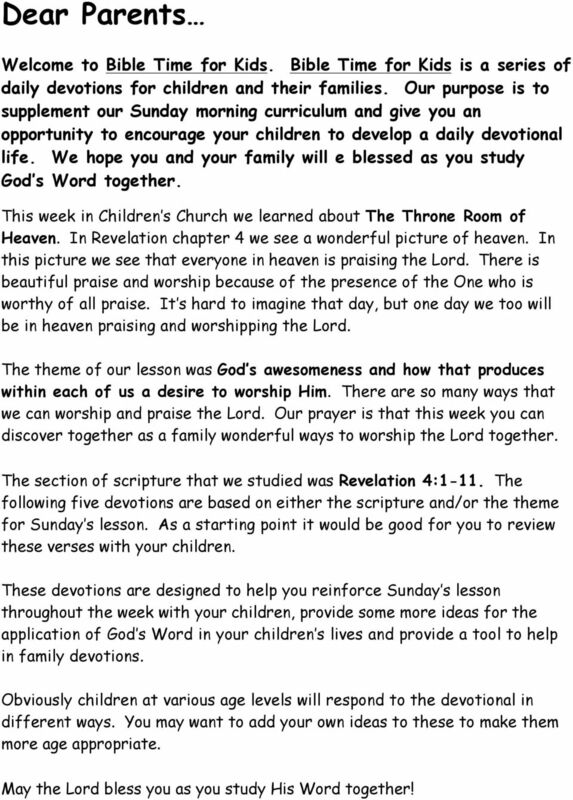 These devotions are designed to help you reinforce Sunday s lesson throughout the week with your children, provide some more ideas for the application of God s Word in your children s lives and provide a tool to help in family devotions. Obviously children at various age levels will respond to the devotional in different ways. You may want to add your own ideas to these to make them more age appropriate. May the Lord bless you as you study His Word together! 3 Day One Approaching God s Throne Text: Isaiah 6:1 - In the year that King Uzziah died, I saw the Lord sitting on a throne, high and lifted up, and the train of His robe filled the temple. Also read Hebrews 4:14-16 As we read in the book of Isaiah about the throne room of God, we see painted an incredible picture. In Isaiah chapter six, the prophet Isaiah sees an awesome vision. He was allowed into the actual throne room of God. If you or I wanted to go into God s throne room, how would we get in? Let s take a look at a story in the Bible where God shows us the way. There once lived a man named Aaron. Aaron was the brother of Moses and was the High Priest in the tabernacle of God. Once a year Aaron was allowed to go into a part of the tabernacle called the Holy of Holies. Inside of the Holy of Holies was the Ark of the Covenant. God s presence rested upon the Ark. Aaron was the only person allowed to go into the Holy of Holies, and he could only go in once per year to make a sacrifice for all the people. And even before he was allowed to go in he had to make a sacrifice for himself so his own sins could be covered. God is holy and NO sin can be in His presence. If Aaron did not offer his own sacrifice he would die as soon as he stepped into God s presence. His job was to sprinkle blood from a sacrifice over the top of the Ark (the mercy seat) in order for the sins of the people to be covered. This was a picture of what God would one day do through His son Jesus for the whole world. Today we don t have to go to God through a High Priest like Aaron. We can look to Jesus as our great High Priest. He has offered Himself as the perfect sacrifice on the cross. He lived a sinless life so there didn t have to be any sacrifice for Him. He then died once and for all so that through Him we can receive forgiveness for our sins and have a relationship with God. Now, even though we have sinned (done things wrong) we can enter into God s presence through Jesus and come boldly into the throne room of God. In Aaron s day, how many people could come into God s throne room? How can we come into God s throne room today? Kid s Bible Dictionary High Priest: A man appointed by God to offer an animal sacrifice once per year in the temple for the sins of the people. Holy of Holies: The place in the tabernacle/temple where the High Priest would offer the sacrifice, represents God s throne room. 4 Day Two God is Holy, Holy, Holy Text: Isaiah 6:3 - Holy, holy, holy is the LORD of hosts; the whole earth is full of His glory! Also read Isaiah 6:1-7 Around God s throne there are living creatures and angels that are singing continually, Holy, holy, holy is the Lord God Almighty. God is so awesome, pure and wonderful that just being close to Him makes all of heaven declare that He is holy. 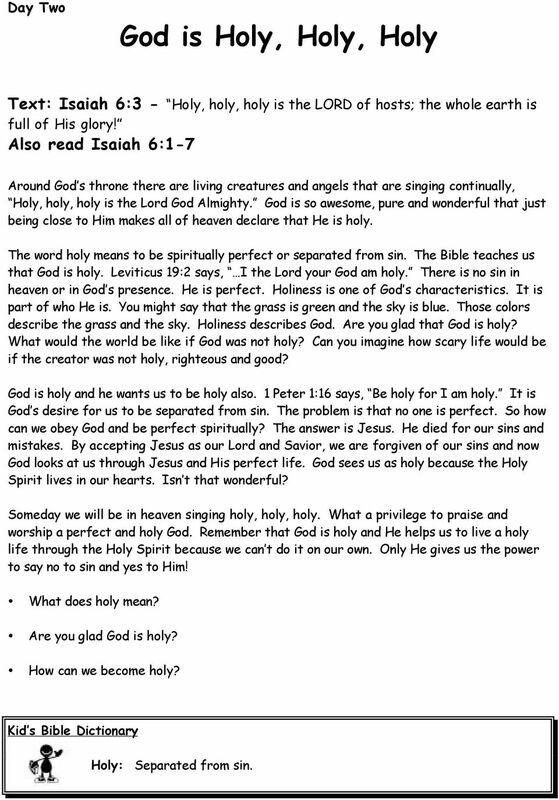 The word holy means to be spiritually perfect or separated from sin. The Bible teaches us that God is holy. Leviticus 19:2 says, I the Lord your God am holy. There is no sin in heaven or in God s presence. He is perfect. Holiness is one of God s characteristics. It is part of who He is. You might say that the grass is green and the sky is blue. Those colors describe the grass and the sky. Holiness describes God. Are you glad that God is holy? What would the world be like if God was not holy? Can you imagine how scary life would be if the creator was not holy, righteous and good? God is holy and he wants us to be holy also. 1 Peter 1:16 says, Be holy for I am holy. It is God s desire for us to be separated from sin. The problem is that no one is perfect. So how can we obey God and be perfect spiritually? The answer is Jesus. He died for our sins and mistakes. By accepting Jesus as our Lord and Savior, we are forgiven of our sins and now God looks at us through Jesus and His perfect life. God sees us as holy because the Holy Spirit lives in our hearts. Isn t that wonderful? Someday we will be in heaven singing holy, holy, holy. What a privilege to praise and worship a perfect and holy God. Remember that God is holy and He helps us to live a holy life through the Holy Spirit because we can t do it on our own. Only He gives us the power to say no to sin and yes to Him! What does holy mean? Are you glad God is holy? How can we become holy? Kid s Bible Dictionary Holy: Separated from sin. 5 Day Three Unclean Lips Text: Isaiah 6:5 - Woe is me, for I am undone! Because I am a man of unclean lips Also read Matthew 23:27,28 When Jesus was here He would often be given a bad time by a group of religious men called the Pharisees. The Pharisees were probably the most religious men that ever lived. They were very careful to keep all of the rules of their religion. Most of the people would look at them in respect and consider them to be very holy men. By looking at them you would also have thought that they were very godly men. One day the Pharisees approached Jesus with a similar group called Scribes or lawyers. They also appeared to be super holy on the outside. Jesus said to them, Woe to you, Scribes and Pharisees, hypocrites! For you are like whitewashed tombs which indeed appear beautiful outwardly, but inside are full of dead men s bones and uncleaness. Even so you also outwardly appear righteous to men, but inside you are full of hypocrisy and lawlessness. These men were fooling all the people around them by their good appearance on the outside, but Jesus exposed their hearts. It was just like a searchlight brightly shining on their lives, which revealed all their hidden sins. Jesus has an amazing way of knowing what is really going on inside of our hearts. Isaiah s heart was exposed when he saw a vision of the throne room of God. Sometimes when we get a good look at God s holiness we see how far from it that we really are. The difference between the Pharisees and Isaiah is that Isaiah did something about it. Isaiah stood in front of God and had the searchlight of God s holiness shine on him, and he realized that he was unclean. Unlike the Pharisees and Scribes, Isaiah repented and allowed God to cleanse him from his sin. Unfortunately, the Pharisees never allowed the Lord to change their hearts. We can allow Jesus to change our hearts and make us more like Him! Who were the Pharisees? What does Romans 3:23 teach us? What happened to Isaiah when he repented? 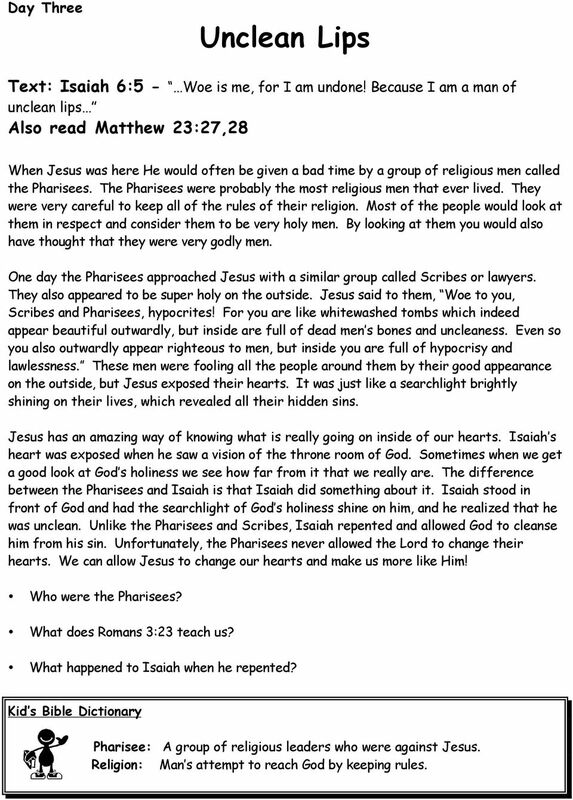 Kid s Bible Dictionary Pharisee: A group of religious leaders who were against Jesus. Religion: Man s attempt to reach God by keeping rules. 6 Day Four Clothed in White Robes Text: Revelation 4:4 - I saw twenty four elders sitting clothed in white robes. Also read Luke 5:12-15 There is an interesting story in the Bible about a man with leprosy. Leprosy is a disease that causes you to lose the feeling in your fingers, toes and all over the outside of your body. Often lepers would have no fingers, toes or noses because they could not feel it when they would injure them and they would lose these parts of their bodies if they were hurt. If you were a person with leprosy, you would not be allowed anywhere near your family or friends again. You would probably be sent away to live in a community with other lepers. You would be an outcast from society, unclean and not allowed near anyone that was not another leper. No one would touch you, hug you or kiss you, not even your own parents. One day Jesus was walking through a city when He came upon a man with leprosy. The leper cried out to him and asked him to heal him if He was willing. The crowd must have been disgusted by the man and probably kept their distance. But Jesus came to him and put out His hand and touched him, saying, I am willing; be cleansed. And immediately the leprosy left him (Luke 5:13). Jesus touched him when no one else would. And He made him clean from his leprosy. The Bible says that God desires to do the same thing with us. Leprosy is a picture of sin in the Bible. And we are all sinners (Romans 3:23). So we have a form of leprosy. Through the sacrifice of Jesus on the cross and resurrection from the dead, we can call out to God for mercy and He will touch us and make our hearts clean. God s will is to cleanse all people from the leprosy of sin. Isaiah 1:18 says, Though your sins are like scarlet, they shall be white as snow. When we read of those with white robes in heaven, we see that they represent those that have been cleansed by God from their sins. Why was leprosy such a sad disease? Who cleansed the leper? How can we be cleansed from our sins? Kid s Bible Dictionary Leprosy: A serious disease affecting the skin with no cure in Bible times. White Robes: Represents righteousness, given to those who trust in Jesus. 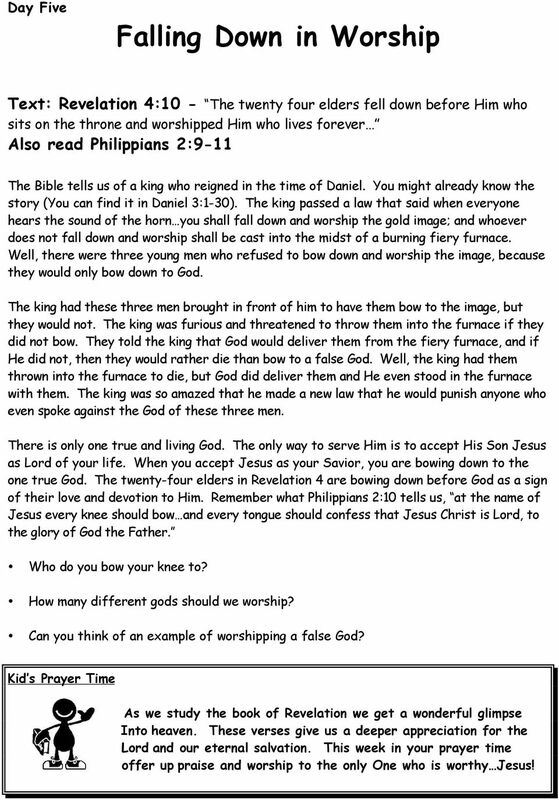 7 Day Five Falling Down in Worship Text: Revelation 4:10 - The twenty four elders fell down before Him who sits on the throne and worshipped Him who lives forever Also read Philippians 2:9-11 The Bible tells us of a king who reigned in the time of Daniel. You might already know the story (You can find it in Daniel 3:1-30). The king passed a law that said when everyone hears the sound of the horn you shall fall down and worship the gold image; and whoever does not fall down and worship shall be cast into the midst of a burning fiery furnace. Well, there were three young men who refused to bow down and worship the image, because they would only bow down to God. The king had these three men brought in front of him to have them bow to the image, but they would not. The king was furious and threatened to throw them into the furnace if they did not bow. They told the king that God would deliver them from the fiery furnace, and if He did not, then they would rather die than bow to a false God. Well, the king had them thrown into the furnace to die, but God did deliver them and He even stood in the furnace with them. The king was so amazed that he made a new law that he would punish anyone who even spoke against the God of these three men. There is only one true and living God. The only way to serve Him is to accept His Son Jesus as Lord of your life. When you accept Jesus as your Savior, you are bowing down to the one true God. The twenty-four elders in Revelation 4 are bowing down before God as a sign of their love and devotion to Him. Remember what Philippians 2:10 tells us, at the name of Jesus every knee should bow and every tongue should confess that Jesus Christ is Lord, to the glory of God the Father. Who do you bow your knee to? How many different gods should we worship? Can you think of an example of worshipping a false God? Kid s Prayer Time As we study the book of Revelation we get a wonderful glimpse Into heaven. These verses give us a deeper appreciation for the Lord and our eternal salvation. 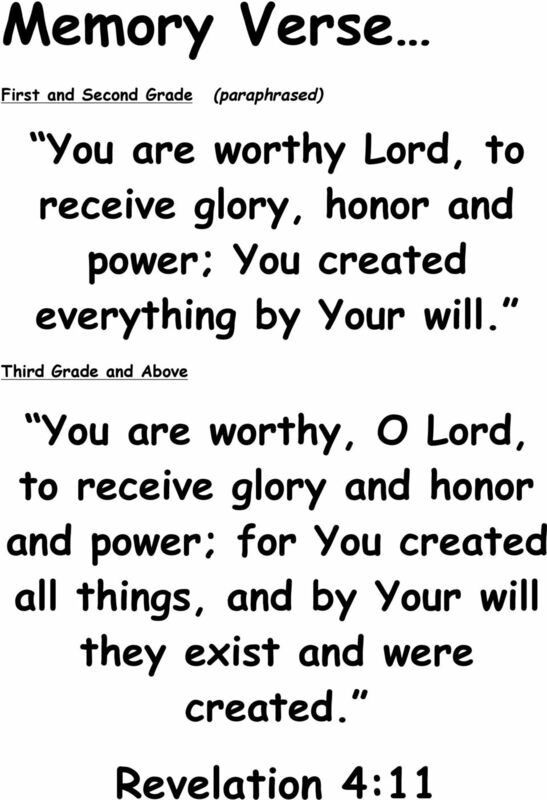 This week in your prayer time offer up praise and worship to the only One who is worthy Jesus! Before We Get Started: Session 2 Recap (5 mins.) !!!!!! What To Expect (2 mins.) Have someone in your group READ this section:! International Bible Lessons Commentary Luke 17:11-19 New International Version International Bible Lessons Sunday, May 8, 2016 L.G. Parkhurst, Jr. Lesson 171 Sanctified Lips Isaiah 6:1-13 MEMORY VERSE IS AIAH 6:1 In the year that King Uzziah died, I saw the Lord sitting on a throne, high and lifted up, and the train of His robe filled the tem ple. Life Lesson 103 Isaiah Intro to the Major Prophets Isaiah 40:8, 53 Introduction We ve studied the books of law, history, and poetry. Now we have come to a new section of the Bible, the major prophets.